That is just a small passage out of the long, long discussion in the Book of Hebrews upon the blood of Christ which makes atonement for the soul [Hebrews 9:22-23]; all of which language has its meaning by which God taught us to understand the meaning and the language of heaven, all of which is found here in the Levitical sacrifices. In 2 Timothy, the third chapter and the sixteenth verse, Paul said, "All Scripture is given by inspiration of God" [2 Timothy 3:16]. All Scripture, not pieces of it, or parts of it, or sections of it, or what may be interesting – all of it is given by inspiration of God, all of it is inspiro, God-breathed. That’s the reason that a long time ago, whether anybody was interested in it or not, I set myself to an attempt to preach the whole Bible. Every syllable of it, every sentence of it, every verse and chapter and book of it is God-breathed, God-inspired. And God had some reason, out of a multitude of things He could have written in the Bible – God had a reason for these things, and in prayer we have set ourselves to learn them. In the one hundred nineteenth Psalm and the eighteenth verse, the psalmist said, "Open Thou mine eyes, open Thou mine eyes, that I might behold wondrous things out of Thy law" [Psalm 119:18]. They didn’t have any New Testament then. He was speaking of the Mosaic books, and up until the time this psalm was written, the other books of the Bible. "Open Thou mine eyes." Give me an understanding heart. "Open Thou mine eyes, that I might see wondrous things out of Thy law" [Psalms 119:18]. Now when one picks up the Book of Leviticus, he first would think out of all of the uninteresting, non-pertinent, non-applying, ancient, tribal, long-forgotten antique ceremonies and rituals and rites that have no meaning, and no message today, out of all that one could ever think for or discover were he an archaeologist, the most dry and uninteresting and without pertinency is to be found in the Book of Leviticus. It is absolutely the opposite of that! 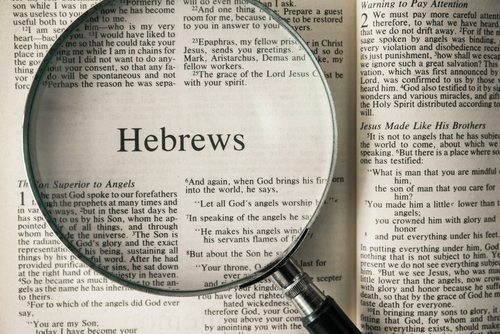 The Book of Hebrews in the New Testament, which presents the atoning sacrifice and the meaning of the expiatory offering of Christ, the Book of Hebrews makes Leviticus the most meaningful, one of the most meaningful books in the Bible. It is just that our hearts are heavy in understanding, and our ears are dull in hearing, and our eyes are veiled in seeing; we need God to take away the veil from our hearts and our eyes to give us a golden ear, to give us an understanding spirit. And when we do, this book is alive; it is the very breath and presence of God, and it has in it the language and the symbolism of heaven. Now in the little while that we have this morning, we’re going to follow those five Levitical sacrifices. There were just five; we’re going to follow these five offerings. And in just the moment that this hour affords us, we shall see what God had revealed to His people in this language and symbol from heaven. The first offering is in the first chapter of the Book of Leviticus. The entire chapter is a description of the first Levitical sacrifice; it is the whole burnt offering [Leviticus 1:1-17]. As one entered the gates into the enclosure, whether of the tabernacle or of the temple, the first thing he saw was the great altar, the altar of sacrifice. It was made out of brass, and before it the priest officiated. The burnt offering was a sacrifice anybody could make anytime, whenever he wished. The burnt offering was his to dedicate to God. For those who would not, or who did not, offer for themselves, God provided a daily burnt sacrifice; in the morning, a lamb; in the evening, a lamb; every day, every day, all the days [Exodus 29:39]. Every day in the year, in the morning there was a burnt sacrifice, a lamb offered up to God. In the evening there was a burnt sacrifice, a lamb offered up unto God. It was the hour of prayer. In the New Testament you will find several times the disciples going up to the temple at the hour of prayer. It was at the hour of the burnt sacrifice: in the morning at 9:00 o’clock, in the evening at 3:00 o’clock. God was giving us a language, God was giving us a type, a picture, that we might understand the nature of God, the nature of our own transgression and what it is that washes our sins away. For example, in John [1:29], when the great Baptist preacher points out Jesus, as He walks by on the banks of the Jordan River, John the Baptist says, "Behold the Lamb of God that taketh away the sins of the world" [John 1:29]. We know what that means because God taught us the language of heaven. And to any Jew who had ever been at that sacrificial altar, had seen on any morning or any evening the whole burnt offering offered unto God, immediately he knew what John meant when he said, "Behold the Lamb of God that taketh away the sins of the world" [John 1:29]. Any offerer could come, bringing a lamb or from the herd. He came to the north side of the altar [Leviticus 1:11], and there his victim was tied to one of the horns of the altar. The offerer knelt down and put his hands on the head of the victim, and there confessed the sins and the transgressions of his soul [Leviticus 1:4]. Then, the victim was slain and its blood poured out at the base of the altar [Leviticus 1:5]. And the victim was burned on the altar, a whole burnt sacrifice unto God [Leviticus 1:7-9]. The reason why he kneels and puts his hand on the head of the victim and there confesses his sin, that identifies the sinner with the victim. "This is now a representative of me." We died with Him. We were buried with Him. We were raised with Him [Romans 6:6-8]. Our identity is in Christ. And when He suffered, we suffered. When He died, we died. And when sin was expiated, it was ours. He was made sin for us [2 Corinthians 5:21]. It identified the offerer with the victim. And the victim dies in the name of, representative of, instead of the worshipper, who bowed and confessed over the head of the innocent animal the sins of his soul. The burnt offering was an offering for sin. In a moment we will come to the sin offering, which is an offering for sins, plural, sins, for separate, individual, private transgressions[Leviticus 4:1]. But, this burnt offering is an offering for sin. That is, the man, the offerer, felt the innate, inherent depravity of the soul. We are not what we ought to be. We are not what we could be. There is a lack in our obedience, in our holiness, in our devotion. We never quite measure up. We are never quite what we ought to be. And that sense of shortcoming and sin is confessed in this whole burnt sacrifice, "Dear God, upon me and the lack in my life, may God be merciful." And this victim is an expiation, a washing away of that inherent depravity in all of our lives. Those old-time theologians preached "total depravity." Not that we are as evil and bad and wicked and vile as we could be, but they meant by that, that evil has entered into all of our faculties. We are a fallen humanity. Into our emotions, into our visions and dreams and lives, there is always a lack and a shortcoming. And the whole burnt offering was an admission to God of the need, the depravity of our lives. And the sacrifice out of the flock or out of the herd was offered unto God to make atonement for the soul [Leviticus 1:2-4]. That easily, that is the picture, as John pointed out, of the Lamb of God [John 1:29]. All of us belong to a fallen humanity, and God demands expiation for our sins [Hebrews 9:22]. And that expiation is found in the cross of the Son of God [Hebrews 9:28]. That is the meaning of the burnt sacrifice, the whole surrendered life unto God, to teach us the language by which God could show us the meaning of the cross of Christ. Now the second Levitical sacrifice is in the second chapter and the whole chapter describes the second Levitical offering [Leviticus 2:1-16]. You have it translated here, in your King James Version of the Bible, "the meat offering" [Leviticus 2:1]. Long time ago, three hundred years ago, "meat" was used just for food. It was an old English word for food. I would translate that, change it, say to "meal offering." Just change that last consonant: meal offering or wheat offering or bread offering. It was never offered by itself. It was always offered in conjunction with a burnt sacrifice. It was of three kinds. In the first verse it was an offering of fine flour, ground and bruised grain, real fine [Leviticus 2:1]. Here, in the fourth verse, it is a baked loaf of unleavened bread, fine flour baked in an oven [Leviticus 2:4]. And in the fourteenth verse, it is the first fruit of the new harvest, crushed, and the grains offered unto the Lord [Leviticus 2:14]. In the first verse you are told to offer it with oil, oil upon it, and frankincense [Leviticus 2:1]. All of that is very plain. The ground flour, crushed and bruised and broken, is, as the Lord said, in the twelfth chapter of John, "The grain that falls into the earth and dies" [John 12:24]. And it’s a picture, He says that He is that grain of corn: it is a picture of the bruising of our Savior. He was bruised for our iniquities [Isaiah 53:5]. He was crushed and ground under the iron wheels, the juggernaut of our sins. And the wrath and penalty of our iniquity fell upon Him [Hebrews 9:28]. And the fine flour, baked in an oven [Leviticus 2:4], the sufferings of our Lord [1 Corinthians 11:24]; or the crushed ears of the grain, all of that is a picture of our Lord; baked in an oven, the bread God gives us from heaven [John 6:41], and the oil upon it is the oil of the Holy Spirit [1 Samuel 16:13]. And the frankincense is the fragrance of the prayers by which His sacrifice ascended and was offered unto God [Psalm 141:2]. So that’s the second Levitical sacrifice. The third one that I speak of is in the fourth chapter. I’m going back to the third one last [Leviticus 3:1-17]. The fourth one is the sin offering [Leviticus 4:1-5:13, 6:24-30]. The sin offering was in behalf of first the priests [Leviticus 4:3-12], second the congregation [Leviticus 13-21], third the ruler [Leviticus 4:22-26], and fourth any one of the common people [Leviticus 4:27-35]. The sin offering was also like the burnt offering, one of the most meaningful. Just as in the burnt offering, the man who had sinned – this is an offering for sin – the man who had sinned brought the offering through the gates to the north side of the tabernacle. There again, confessed over its head the transgressions, the sin that he asked forgiveness for [Leviticus 4:23-24]. But in this one, when the animal was slain, the blood was taken into the Holy Place and there sprinkled before the veil and on the horns of the golden altar of incense of prayer [Leviticus 4:17-18]. Then the remainder of the blood was poured out at the base of the altar [Leviticus 4:18]. Then the body, when the inward parts were burned on the altar, the body was taken outside the camp and burned outside the gates [Leviticus 4:21]. All of that was another picture of our Lord. In 2 Corinthians the last verse in the fifth chapter, "For God made Him to be sin for us, Him who knew no sin; that we might be the righteousness of God in Him" [2 Corinthians 5:21]. He was our sin offering, our Savior was; and where was His body offered unto God? [John 19:20; Hebrews 13:12] The sin offering was taken outside the camp, outside the gate, and there it was burned [Leviticus 4:21]. The sin offering was burned outside the camp, beyond the gate [Leviticus 4:21]. So, our Lord suffered for our sins outside the city, outside the gate, on the place called "The Place of a Skull" [John 19:17-18]. Now the fourth sacrifice. In the fifth chapter of the Book of Leviticus is the trespass offering [Leviticus 5:14-19]. And the difference between the trespass offering and the sin offering is this: the sin offering is against God. The trespass offering has in it another added feature, when we sin we sin against God. In the fifty-first Psalm, "Against Thee, and Thee only, I have sinned, and done this evil in Thy sight" [Psalm 51:4]. But when we sin we also sometimes trespass against our neighbor. As Paul says, "No man liveth unto himself, and no man dieth unto himself" [Romans 14:7]. As he said, again, in the twelfth chapter of 1 Corinthians, "We are all members, one of another [1 Corinthians 12:12]. And if one member suffer, we all suffer with it" [1 Corinthians 12:26]. Consequently, when I sin against God it also has a repercussion: my neighbor sometimes is hurt; I trespass against him. Now the trespass offering is a sin offering with this added: the man who offered it made amends for his transgression. In the sixteenth verse, "He shall make amends for the harm that he hath done, and shall add the fifth part thereunto" [Leviticus 5:16]. In the next chapter, in the sixth chapter, the fourth through the fifth verses, "He shall restore that which he has taken away, or the thing which he has deceitfully gotten, or that which was delivered him to keep, or lost which he has found, of all that . . . he shall restore . . . and add to it a fifth part" [Leviticus 6:4-5]. Now may I just pause here to say the doctrine of restitution is one of the great ingrained principles found in the very fabric of the Word of God: to restore what we have taken away. The doctrine of restitution; if I have wronged a man, I am to go to him and make it right. If I have taken anything material from him, or in any way deprived him, I am to restore it. Then come and offer unto the Lord. Do you remember again, Zaccheus, when he was converted? He said, "Lord, if I have taken aught from any man, I restore him four times as much as I took away, fourfold, I restore it" [Luke 19:8]. The doctrine of restitution here in the trespass offering is all through the Word of God. We ought to have the spirit of one who would seek to make amends for, in anything, wherein we have wronged somebody else. That is what it is to be a servant of the Lord. Now the peace offering I have left to the last because the peace offering is a thanksgiving offering. And I wanted to speak of it last because of this particular Sunday which is before our national Thanksgiving Day. The third chapter of the Book of Leviticus, and a part of the seventh chapter, is given to what you have translated here "the peace offering" [Leviticus 3:1-17; 7:11-21, 28-34]. If I could give it a name that would be more descriptive I would call it "the thanksgiving offering." From the beginning, or let me say it this way, the word translated "sacrifice" – back here in the Old Testament, the word translated sacrifice in the beginning, back there in the days of Cain and Abel, the root meaning of that word sacrifice is gift, a gift. From the beginning, in the very constitution of the man God made, there has always been that feeling, that impulse, that urge to give unto God a token of our thankfulness to Him for what God has bestowed upon us [Genesis 4:3-4]. Now, the thanksgiving offering could be made by anyone, anytime. It could be of the herd [Leviticus 3:1-5], of the flock, male, female [Leviticus 3:6-11]. There was no interdiction on any offering that anyone would like to bring, a thanksgiving offering. Then it had this other beautiful, beautiful arrangement. These other offerings were either wholly burnt or else they were for specific sins and transgressions, and had many things that concerned just that sin and that transgression. But this offering, the thanksgiving offering, was a communal meal shared by the priests and their families, by the offerer and his family, and by his friends, and just anybody that he wanted to invite [Leviticus 7:15-18]. I have had people leave this church because they refused to countenance our eating down here at the church. I have talked to some fine families who have left this church, almost by the hour, and I cannot understand my inability to show them the plain, simple Word of God. In the Old Testament, so much of this sacrificial system was built around a communal meal between God and the family and their friends. The Passover was that. The thanksgiving sacrifice was that. So many of the other oblations were that. And in the New Testament, if I were to say they did anything above anything else, they did this: they were eating together all the time. They had the Lord’s Supper every time they ate, to begin with [Acts 2:42, 46]. They had what they call an agapē. Agapē is the Greek word for "love feast." And when God’s people came together, they ate. They broke bread together. And one of the finest arrangements that you could ever make for you and your friends in this church or in your class is to have a lovely meal together. There is something about it that blesses everybody. But I cannot understand, because of the excesses that the Lord suffered in the eleventh chapter of 1 Corinthians [1 Corinthians 11:21-22], therefore, some of these people say, "No eating at all." Well, you might as well say we weren’t going to wear any clothes because some people go to extremes in their clothes. Or you might as well say we weren’t going to have any marriage anymore because some people go to extremities in the way they act when they marry. And you might as well say we weren’t going to have any houses or anything else anymore, simply because some people go to extremes. It’s the same thing. You can take anything and go to an extremity with it, just like the Lord’s Supper. They got drunk and they gormandized at the meal. And Paul said, "That is not right. That is a holy ordinance and should be observed in a holy way." But by no means are we to take that admonition concerning the extremities to which the Corinthians went in their typical Corinthian manner [1 Corinthians 11:21-22], to destroy one of the great, sweet, and blessed institutions in the family of God [1 Corinthians 11:23-26]. And you have a typical instance of it here in the thanksgiving offering. The man comes with his victim from the herd or the flock [Leviticus 3:1-5]. And he brings it and there they have that same ritual – all of it, of course, is a dependence upon God and a looking up to heaven – and the man brings his offering, and he says, "I just feel in my soul that I want to thank God for" . . . and then just think what you could say, "I want to thank Him for creation itself." "I want to thank Him for preservation." "I want to thank Him for forgiveness." "I want to thank Him for life and love and health"
Or home, or happiness, or child, or family, or country, or . . . what would you stop at? Just the feeling of gratitude in his soul. So the man brings his offering, a thanksgiving offering. And there it is offered on the altar, except this time it is eaten [Leviticus 7:15-18]. And after it is cooked, barbecued, there on the altar, why, the priest and his family and the offerer and his family and any friends, they all gather round and they had a meal offering. Remember I said a while ago, with oil and frankincense [Leviticus 2:1]. And they all ate there together unto the Lord. That is why, when you have the Lord’s Supper, it is sometimes called the eucharist or the "Eucharistic meal." The Greek word for "to give thanks" is eucharisteō. And the Greek word for thankfulness, for gratitude, is eucharistos, and that word, the Eucharist, the Eucharist, "the thanksgiving," the gratitude. And it comes from the fact that, when Jesus took the bread, He eucharisteō, He gave thanks and brake and they ate [Matthew 26:26]. And, it says in the Bible, "And He took the cup and eucharisteō, He gave thanks" [Matthew 26:27]. It’s the Eucharist, giving thanks unto God before the bread is broken and we eat, or the cup is shared and we drink, a thanksgiving. The Lord’s Supper is a Eucharist. It’s a thanksgiving, it’s a gratitude to God for what Jesus has done in dying for our sins [Romans 5:8; 2 Corinthians 5:21]. Now, may I say this little word about the spirit of that thanksgiving offering? There is altogether too much of the grumbling in our Christian lives, too much of the fault-finding with what God has done, and too much of the spirit of unhappiness and restlessness in all of our people. And there is too little of the adoration and the praise and the thanksgiving unto God. You read those Psalms and see how much of it begins with "Hallelujah." Or as you translate it, "Praise ye the Lord,.Come into His court with thanksgiving… Bring an offering and dedicate it in His name." The Lord has been good and I thank Him. He has been good, He has been wonderfully, graciously good." "Why," says a man, "I grumbled because I had no shoes until I saw a man who had no feet." To be grateful unto God it is a part of the spirit of the Lord in us. Not a mean spirit, not a grievous spirit, but an overflowing spirit, a glad spirit, a grateful spirit, "Thank You, Lord." A cup of cold water, a crust of bread, "Thank You, Lord, thank You, Lord." I want to tell you this: in preparing this sermon my mind went back to a woman and a little girl. The little girl,how old would a little girl about that high be, a little girl? It was in 1947, just two years after the Second World War. We were bunched together – herded together like they do at these immigration stations – at a port in England going across the channel into France. And there was a long line waiting there to get on the ship, a long line of people going across the channel, and a long wait as usual. So right if front of me was this English woman and that little girl. Because of the length of the time, I began to talk with her and began to visit with her. That was one of the most unusual women I ever visited with in my life. Her dress was so shabby and seedy; all of Britain looked like that. They hadn’t had any new clothes for years and years. And the little girl was dressed like that: seedy and shabby and kind of like rags, nothing fine at all. And as I visited with her, I found out that her husband and she and the little girl lived in London. And one of those vengeance weapons had come over and had fallen and exploded right in front of their house. Her husband was killed. Her home was burned. And she reached down and parted the hair of that little girl. She had made the little girl’s hair come down on her forehead in heathered bangs. When she pulled the bangs aside, starting right there and clear through was the ugliest, awfulest scar I think I ever saw. The little girl was almost killed herself, but somehow was spared and left that awful scar. And there she was, and in the awful privation and hardships of the war – her husband dead and left there with that bleeding child. And I started to commiserate, you know, to pacify, to mollify, to sympathize. And she said, "Oh, no, oh no!" She said, "God has been wonderfully good. For," she said, "He left me to care for my little girl, and I thank Him for that." And she said, "God left me something else." Well, I thought, you know, something big or something fine or something great. She said, "Out of all of that wreckage, God left me a typewriter." And she said, "I took that typewriter and for these years since, I have been typing, day and night, at Oxford University for some professors there. And in that way, I can take care of my little girl and stay at home." "Oh," she said, "God has been wonderfully good to me. He left me the typewriter." I just wonder how many of us, if a bomb were to fall and our families decimated and a little child bleeding, left in our arms – everything gone, if we could thank Him because God left us, maybe, a typewriter or maybe a pencil or maybe a little something by which we could serve Him and take care of our family? This is a great institution in America, Thanksgiving; it was a great institution in the Levitical system by which God taught His people how to be in the presence of the great King. A thanksgiving offering, just out of gratitude, "Dear God, this is unto Thee." Now, while we sing our song, in this balcony round, somebody you; on this lower floor, somebody you, while we sing our song, to give your heart in trust and faith to Jesus, or to come to the fellowship of the church, would you? Down one of these stairways or into the aisles, would you come and stand by me? "Pastor, today we give our hearts to the Lord." We offer our lives to God." Or, "Today we’re putting our lives in the fellowship of the church." Would you come? On the first note of the first stanza, would you make it now, while all of us stand and sing?